Welcome Message For Our New Members! Hello, my name is Jeff Hutzelman , and I am the Steel Cities Region SCCA membership chairperson. This letter is to give you a little more information on Steel Cities Region and SCCA. I have also included some information on various positions within the Regions Racing, Rally and Solo activities. Since 1944, the Sports Car Club of America is a national group of automobile enthusiasts whom have banded together, 60,000 strong, to help support their love of racing. The SCCA has divided the country into 9 areas called divisions (for example Steel Cities is in the Northeast division of the country). Steel Cities Region is one of 19 regions in the Northeast division dedicated to the support of auto sports of all kind. What does Steel Cities Region do? The Steel Cities Region holds many forms of racing where YOU get to drive. Test your driving skill as you drive your car through a course of cones in a parking lot. All you need is a driver license and a helmet that is 1995 or newer. No special equipment is needed, but your car will undergo a safety check before the event. Speeds rarely exceed 60mph and every second counts. Steel Cities currently holds its auto cross events at PIRC, Pittsburgh International Race Complex and Consol Energy park. A mini version of a road race on a closed course (PIRC, Pittsburgh International Race Complex go kart track). You get three laps each session to better your drive time. This is an excellent opportunity to fine tune your driving skills before the bigger and faster road racing. This is where you start rubbing doors in cars that have roll cages on the big track at PIRC, Pittsburgh International Race Complex and Nelson Ledges (rubbing doors is highly discouraged, however). Successful completion of an SCCA driver school and road racing license is required. Steel Cities Region runs two events at PIRC, Pittsburgh International Race Complex each year, and your help would be greatly appreciated. This competition is a time trial, up a hill, on a closed public road course in cars with roll cages. Fastest one to the top wins. Also known as a time, speed, distance rally. This is not about how fast you go, it is about how accurately you can cover that distance in a given amount of time. Clues are given for each leg of the race. If you arrive too early or too late at the end of each leg, you get penalty points. This contest is held on public roads at below the posted speed limit and the fewest points wins. Want to get closer to the Road Racing action without driving? BE A CORNER WORKER! You cannot get a better view of the racing anywhere else. The racing cannot happen without the corner workers and training is free. 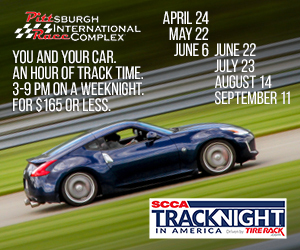 As an added bonus – when you work races you get a discount on your SCCA membership. In addition to corner working, there are many other positions at the track that need filled by volunteers LIKE YOU. For new prospective members, how do you join the SCCA? Just click on the JOIN NOW button and fill out the application at the bottom of the page. Don’t forget to tell the SCCA that you are from region #39, the Steel Cities Region.